Is your Krups Espresso Machine water tank broken or missing? You may need a new water reservoir. This plastic reservoir assembly includes the built-in float that tells your espresso maker that water is present in the tank. 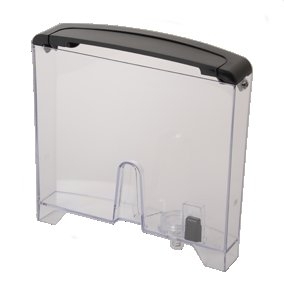 This part is complete with its built-in handle and lid assembly. This Krups MS-0A01425 reservoir also includes the docking valve built into the bottom of the tank. Use this part to re-outfit your Krups espresso maker for optimum performance and brewing. EA8245, EA8250, EA8255, EA8260, XP7000, XP7200, XP7225, XP722570F/J4, XP722570G/J4, XP7230, XP7245, XP724570F/J4, XP724570G/J4, XP7260, XP726070F/J4, XP726070G/J4.